Another day looking more like late March than late February. I needed to get outside and do some nature snooping and shooting. Yesterday, another day of spring found me being domesticated. I had some chores such as changing oil and filters in the cars; raking; washing cars…. I was to visit a friend sometime around 10:30 to do some shooting. 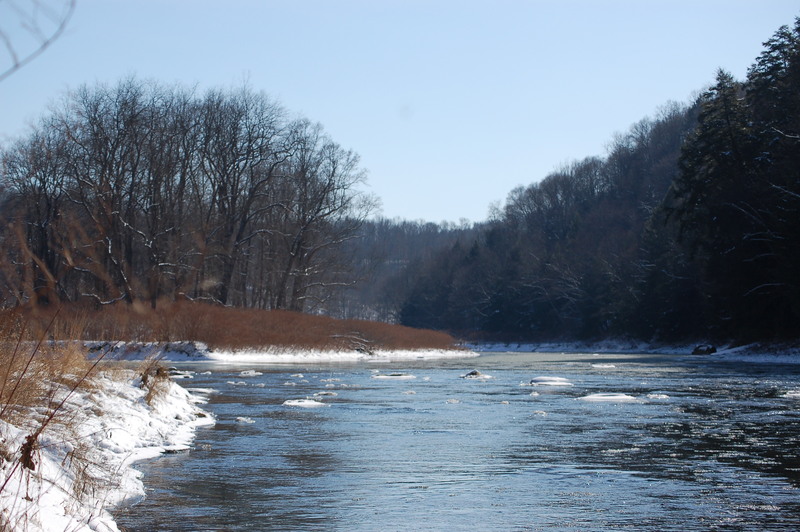 However, after running a few errands, I elected to stop at the mouth of Cowanshannock Creek and the Allegheny River. One never knows what one might see along these waterways. I was looking about when quacking sounds could be heard towards my left. 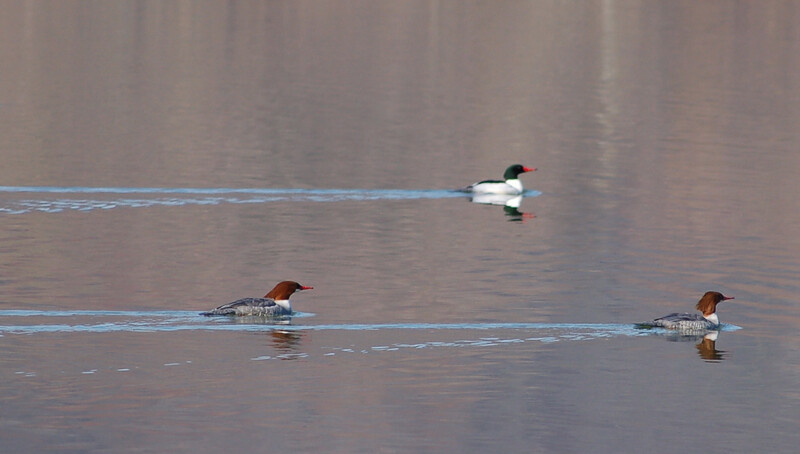 Common or American Mergansers!The waterfowl were exiting the Cowanshannock Creek and entering the Allegheny. 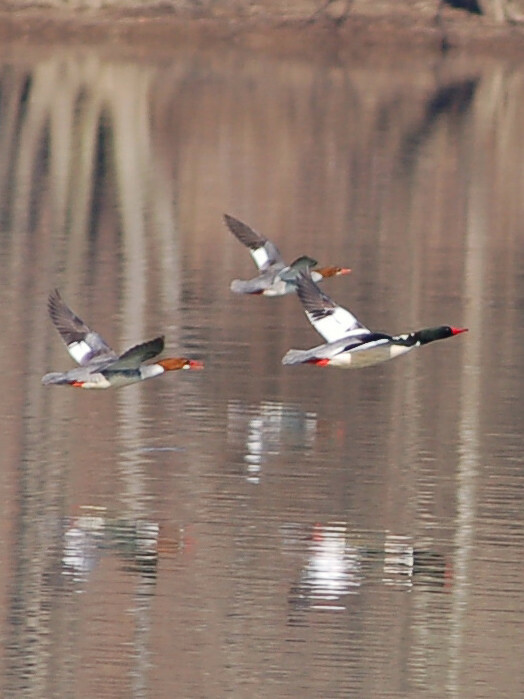 The eight birds were about 40 yards from me and not overly concerned over my presense.I managed a number of photos prior to their flight across the river’s width. I drove up the hill of my friend’s driveway. I was happy to see Larry Delaney and later the exuberant excitement of his dog. 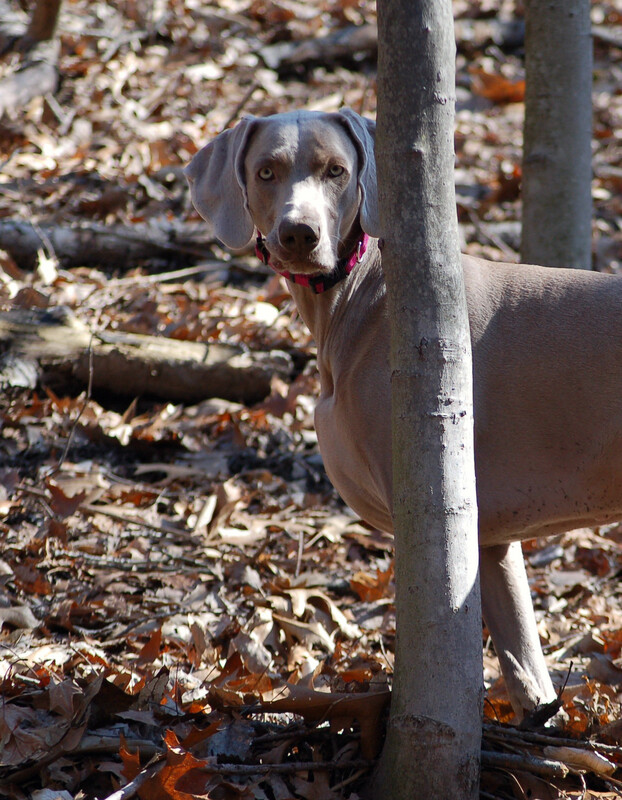 Abby is still a three-year old puppy at heart!The three of us walked around the woods with Abby running all about searching for chipmunks! 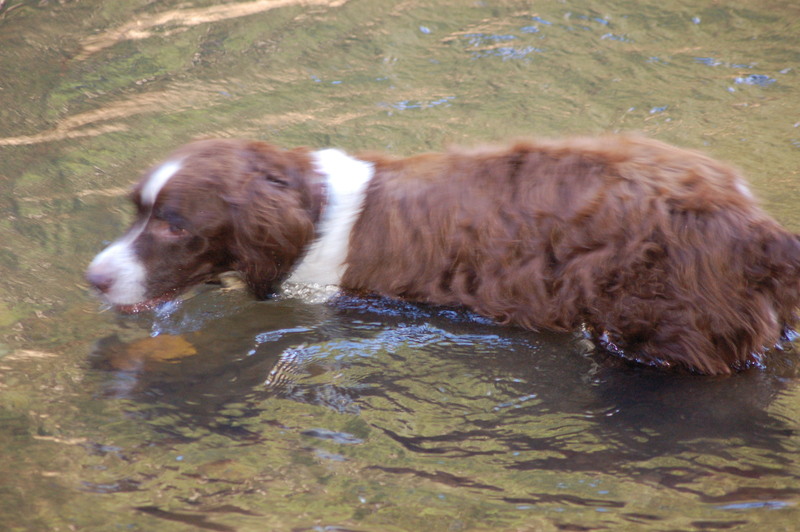 A third, and new, friend named Ruger was with us too. 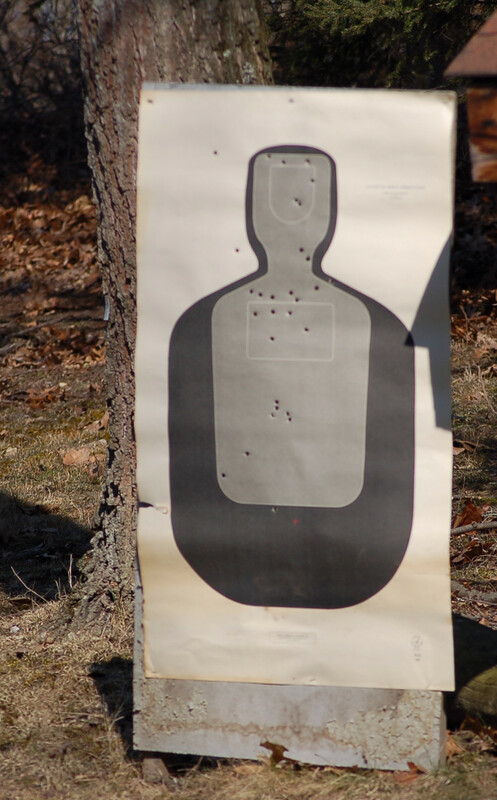 We used a man-sized target to experiment with the shooting ranges and laser sight. 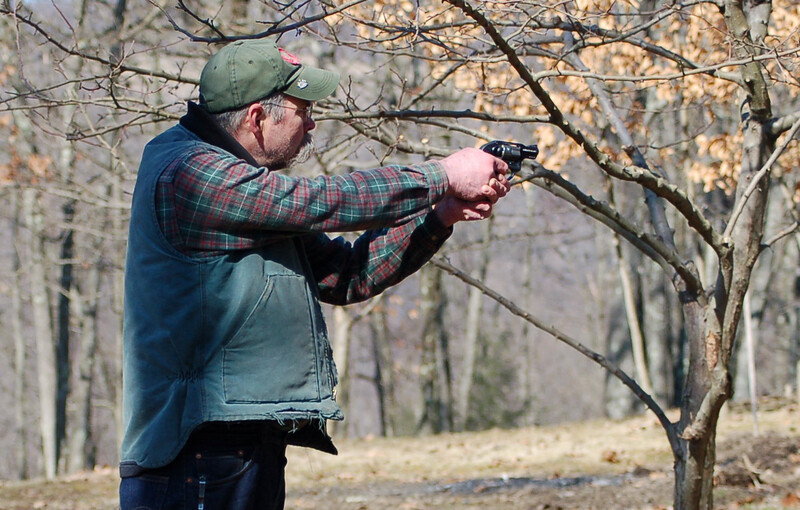 I did better than I expected since I seldom shoot revolvers as I once enjoyed. I shot from about 25 feet to as close as three steps. The close range shots was actually shooting from the hip. Needless to say many shots would have been fatal if a real-life scenario would be happening. Larry and I had some good conversation as our morning evolved. I wish to thank him for his hospitality. Since our retirements, my friend Frank Maus and I have been doing some muskie fishing and hiking. Today, after a discussion we walked along trail known as the Redbank Valley Trail. The trail, although not yet completed, proved to be a great scenic trail. The trail runs along Redbank Creek. RedbankCreek divides the counties of Armstrong and Clarion in western Pennsylvania. The morning was rather brisk and about 4 inches of snow blanketed the area. Snow always tells many stories as we would soon observe. One of the first tracks were those of the fisher. The fisher was once native to our area and drastic timbering operations and over harvest caused the specie to become absent for many years. 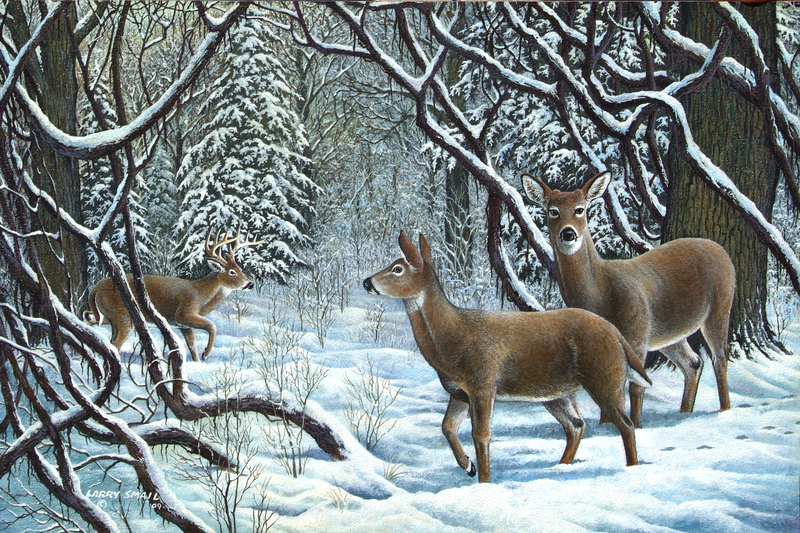 The Pennsylvania Game Commission re-introduced them about 15 years ago and now the mammal is spreading rather well. Other tracks were deer, squirrel,turkeys, fox and mice. A pair of mated coyotes used te trail a lot. We smelled their presence more than once as they marked their territory. While walking a saw a mass covered with snow. I pushed at the mass with my walking stick and a porcupine rolled away. The porky was soft and not frozen. Rigor-mortis nor freezing has stiffened the creature. Neither of us had an explanation as to that fact. One very interesting observation happened. 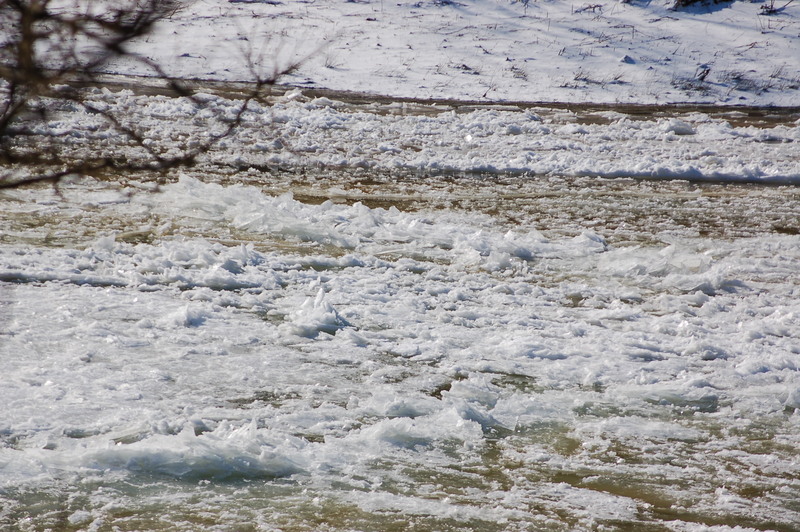 We began to hear backed-up ice cracking when the ice pack began to push and creat ice dams. We, both, felt blessed to have been at the area at that precise time to watch this event. The cracking and pushing lasted about 15 minutes when the movement ceased. 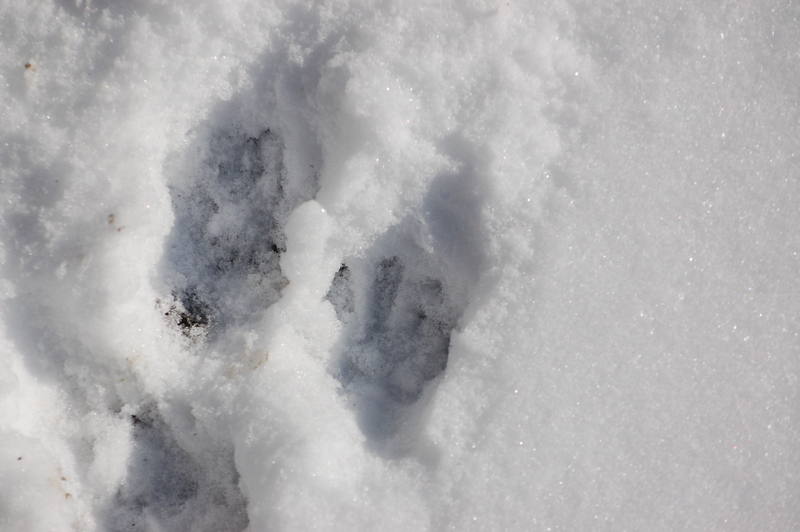 As we were returning we noticed fresh gobbler tracks that were not present earlier. All told we saw 5 deer and 1 turkey. We saw a bat flying although the temperatures were in the thirty degree range. 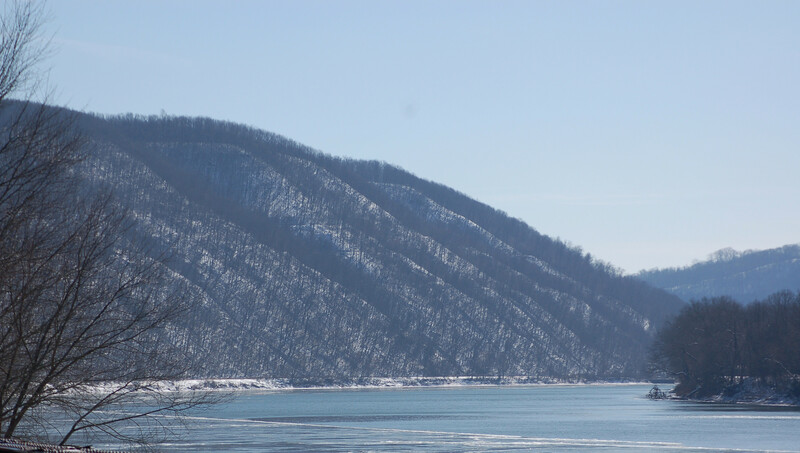 We observed high steep hills; thick hemlock covered hill sides; beautiful icy waters and huge rock outcroppings.The snow had melted off dramatically on our return journey. the February sun was making heat. 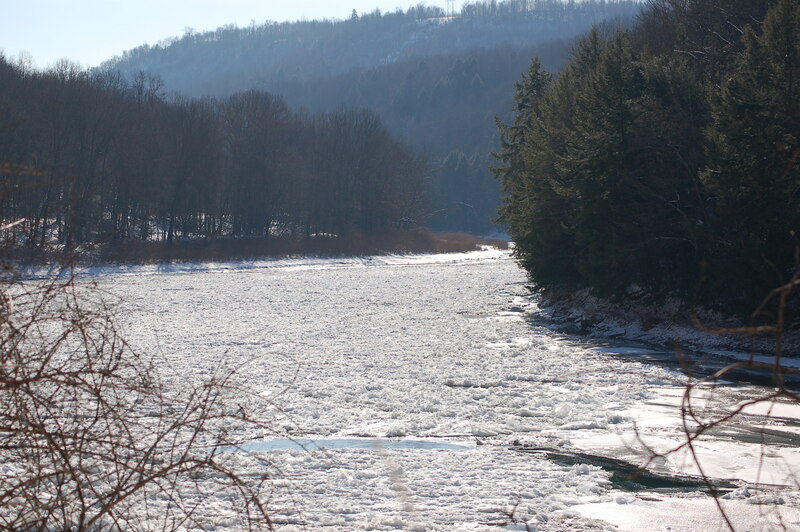 A week ago, I walked along the railroad tracks bordering the western side of the Allegheny River. I saw five fox squirrels; geese; wood ducks and mallards. 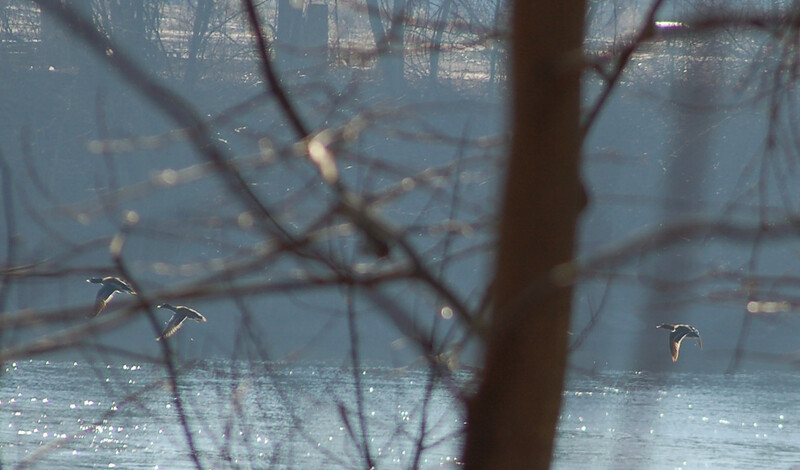 I, also, saw a pair of herons flying overhead. 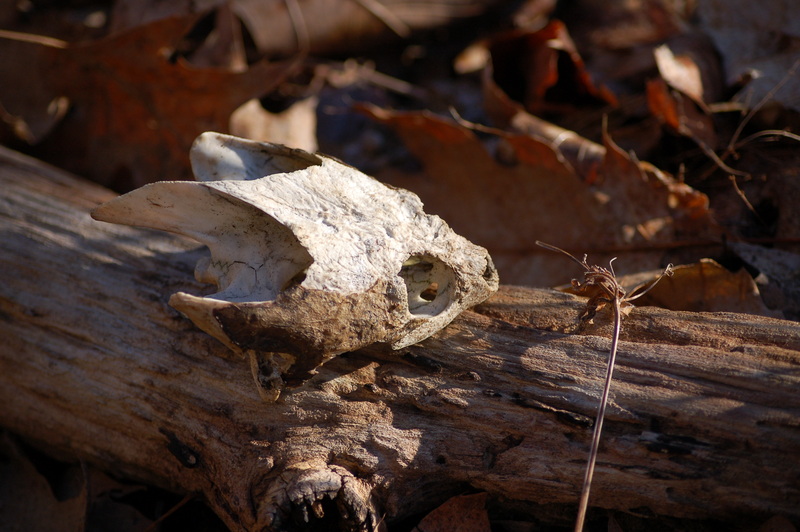 One interesting discover was the skeleton of a snapping turtle.Of course, I gathered much of these bones up. I have added 3 more paintings in my latest paintings link. To view the art go the right and click on the latest paintings link. 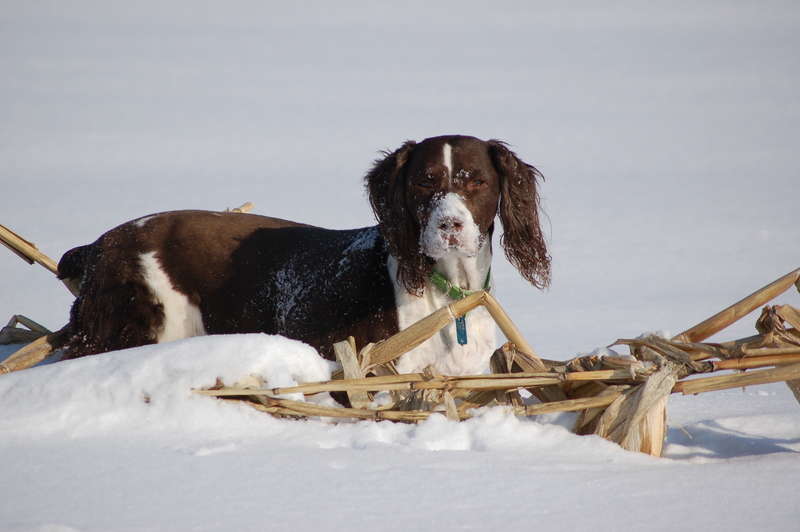 Fourteen years ago on February 6th, 1998, some Springer Spaniels were brought into this world. A short time later, in March, Laurie and her mother, Anne, walked into the basement and two little puppies would crawl into my lap and curl up to fall asleep. I sat on the basement floor holding these two fat-bellied puppies until my backside couldn’t stand it. Suzie would become our puppy and Bridget would become my mother-in-law’s dog. The immediate bond the two of us felt was certain. We became one! Playtime was always fun and great times. I enjoyed playing chase and fetch. The affection and love we shared was, also, immediate. I would lay on the floor and the little pup would come over and cuddle up. Suzie would crawl over your head and neck to find that special place to sleep. As she grew some, her favorite place was right next to me with her head on my chest. Suzie lost her “puppy-ness”way to fast. She was growing daily! We enjoyed woodland and field walks together. She would know when a walk was happening. She sensed our actions and would rush to the door and excitedly bark and run in circles. 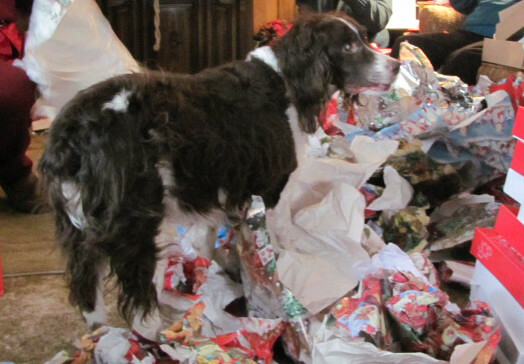 Suzie would open presents. She really loved to be with me when I was butchering deer. Wonder why? The years went way too fast and in 2009, Suzie became ill. I tried to comfort her over night. The next morning we hurried to the vet only to find Suzie had developed diabetes. We were very concerned as the insulin would be part of her life from this point on. 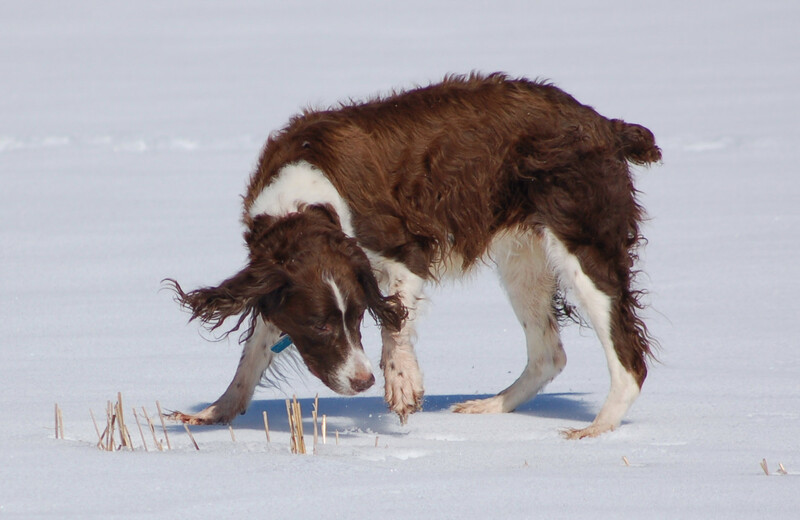 By the end of 2009, a very thin and a weak-looking Suzie had me deciding on a grave site. I almost dug a grave under the hemlock as winter crept in. I waited and Suzie perked up and gained back some weight and hope, once again, was felt by Laurie and I. Unfortunately, we had in the back of our minds what the vet had told us. Well, here we are in 2012, Suzie is still with us. She was diagnosed with diabetes on February 28th, 2009. We have been truly blessed. Yes, she is almost totally blind and hard of hearing. She, occasionally, has accidents, but she still enjoys playing and eating. Laurie and I, both know, Suzie’s time is limited on this earth. We dread that day! 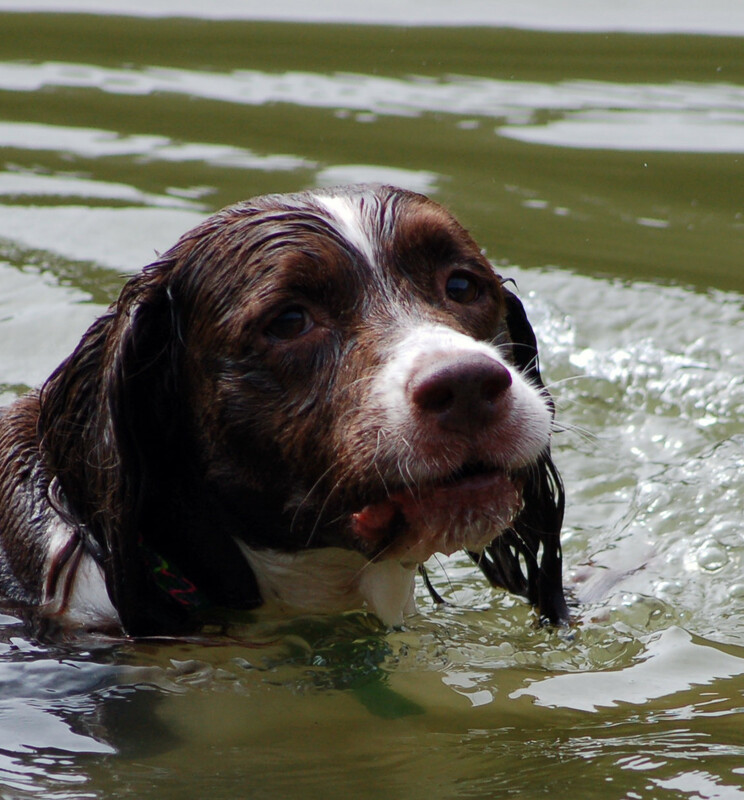 WE realize with the age of 14 and her illness that she could see a turn for the worse anytime. However, until that time we will continue to try to keep her as well as we are able. We will continue to love her and to spoil her all the more! Dogs are the best! 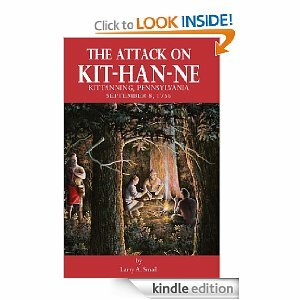 My book entitled, “THE ATTACK ON KIT-HAN-NE” can be found by visiting: Amazon.com and clicking on the “Kindle Book” link on the left.